Chopsticks are best friends. They've been that way forever. But one day one chopstick gets broken and must spend some time away from the other. While one chopstick explores new and different ways to be useful, the other chopstick must remain immobile while he's on the mend. 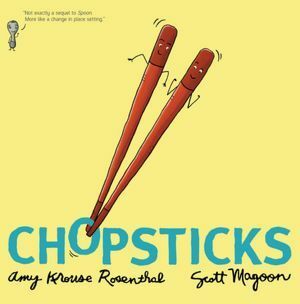 Will Chopsticks continue to be friends after one has explored a new and different world, or will he leave his best friend behind? In this adorable companion to the book Spoon, Amy Krouse Rosenthal's lovely story explores the dynamics of friendship and what happens when one friend goes away and the other must stay put. In addition, she also crafts her writing to allow teachers and students to discuss literary devices such as personification and play-on words. I particularly love that the kitchen whisk was the one who "whisked away" chopstick to get him medical attention - or that "no one stirred, not even spoon" while they were waiting to see if chopstick would be OK.
Don't think that because this is a picture book it is only for little kids. Because of Rosenthal's deft use of personification and puns, this would be a great book to read to older kids as well. I will definitely be reading it to my 6th graders in the near future. Awwwww. This sounds great. I'm going to keep it in mind for little ones in my life. What a delightful sounding book! This sounds like a fun book. My daughter lives in China, maybe I should send her a copy to read to the younger kids she is teaching English to. She is always looking for books like this. Isn't she the one who also wrote Encyclopedia of an ordinary life? I really liked that one. I will have a look into this one, sounds like a great book for children. My 5 year old loves to help in the kitchen and I think he would love this book. Sounds like it has very clever writing. I love the sounds of this one! cute! Maybe for my grandson! Sounds like a very cute book! What a wonderful teaching tool. This sounds fab- especially for my 2 year old who is just learning to use chopsticks and finds it very difficult. Maybe this will help her like them more! This sounds awesome. Bearing it in mind for my nephews!